If you are reading this, you have probably already said “yes” to an invitation to become a director or are seriously thinking of doing so, and now you have in your hands a practical introduction to the world of non-profit boards. You already are or are about to become one of the thousands of persons who serve every year on volunteer boards of directors of non-profit organizations – big and small – that contribute to their communities in a myriad of ways. Whether it is big or small, good “corporate governance” increases the likelihood that an organization will be successful in carrying out the purposes for which it was established. An organization without a dedicated board of governors that functions well does not have good governance and is unlikely to achieve its goals. Doreen Pendgracs encourages her readers to join the many volunteers who put in thousands of hours of work as directors and to participate knowledgeably, with passion and with a good understanding of directors’ roles and responsibilities. With enthusiasm and good humour, she recounts experiences of her own and of others whose paths she has crossed – sometimes frustrating, sometimes satisfying – and conveys the joys of collaborating with others on shared goals. Doreen’s book will open your eyes as a director and assist you to understand the responsibilities you are assuming, including setting goals, developing policy, reading financial statements and managing risks. It will also help you to anticipate and avoid tribulations and troubles including conflicts of interest and, not least, to enjoy what you are doing. I have worked with non-profit organizations for many years, usually as a legal adviser but sometimes as a board member myself, so I know first hand about the hard work and “the pleasures and pitfalls” that fall to the lot of directors – what they help the organization to achieve, how much they give of themselves, and what they may get out of serving on a board of directors on a personal level. 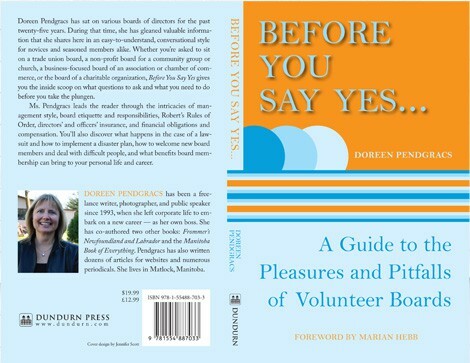 My own experience has overlapped with Doreen’s, so I can attest that she always practises what she preaches (nicely) and that her book will give you guidance and confidence in carrying out your duties as a director.